If your schedule doesn’t allow you to watch NFL games live, then this new NFL Game Rewind application may be just the thing for you. Made specifically for tablets, Game Rewind allows paid subscription holders to watch full on-demand games of their favorite teams. The service is great, but comes with a huge price tag. For full season access including playoffs and Super Bowl action, you’re looking at a full $70. Ouch. If money is not an issue, then the application does offer plenty of features to make it worth it. The app comes with full “Coaches Film” (22 different viewing angles of selected games), instant replays of the game’s highlighted plays and drives, topped off with full analysis of every game. 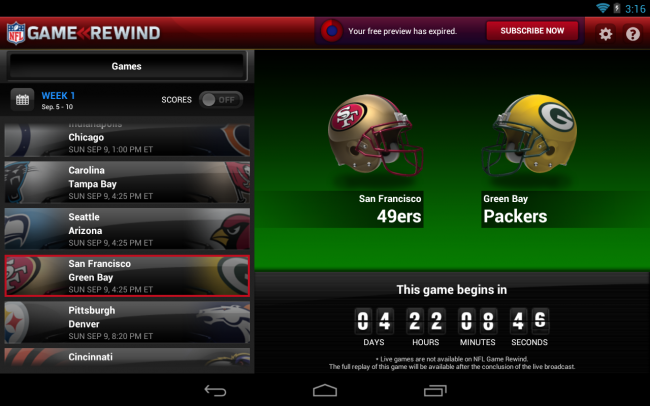 For a football and tablet lovers, it doesn’t get much sweeter than this.